Dale Chihuly is one of my favorite artists. 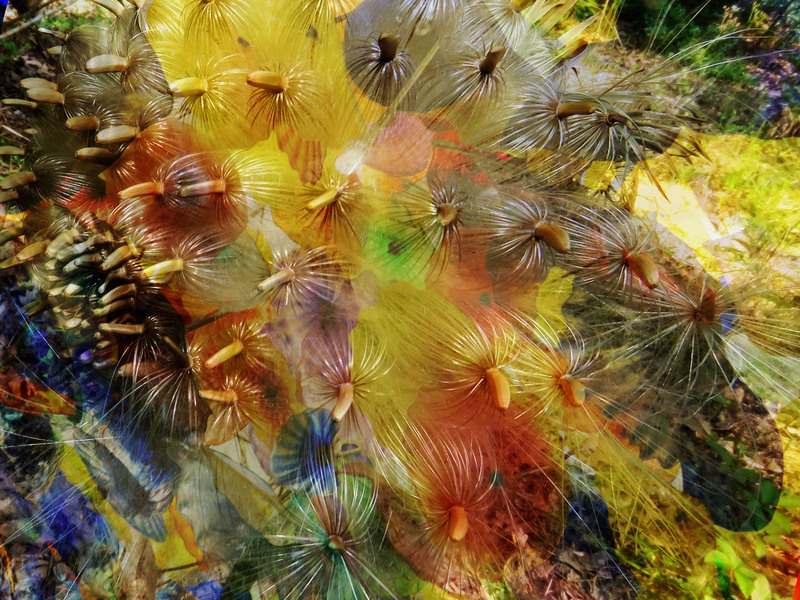 His glass artworks are often inspired by nature, and they also complement natural settings. Fiori di Como, 1998. The ceiling of the lobby of the Bellagio hotel in Las Vegas. There is a much better photo on the Chihuly website. and I go to his two galleries there. I love them because the staff are so welcoming — when you come in, the first thing they say is, “You may take pictures here!” I’m not buying an $8000 original glass sculpture, I’m only buying a $15 calendar, but you’d never know it from the way they act. 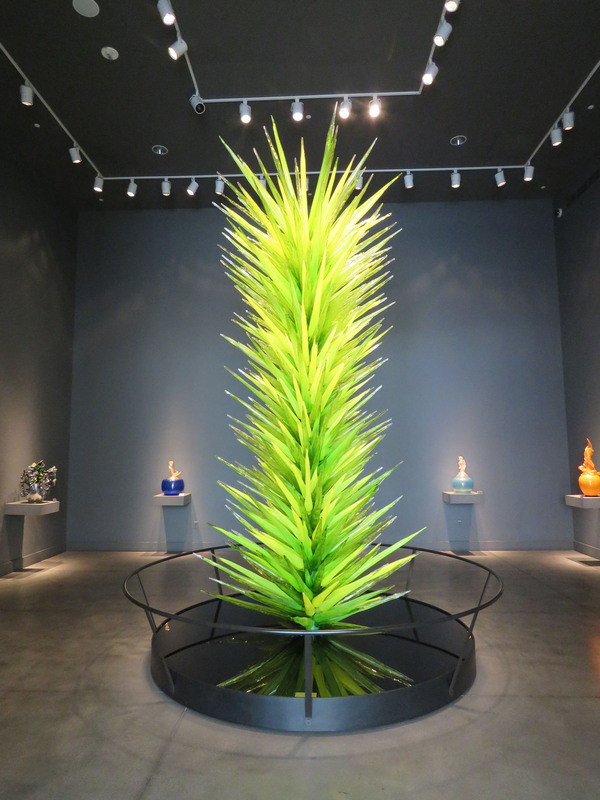 Chihuly sculpture from Las Vegas gallery. A gorgeous vessel. I love the way it balances strength and fragility, unity and variety. 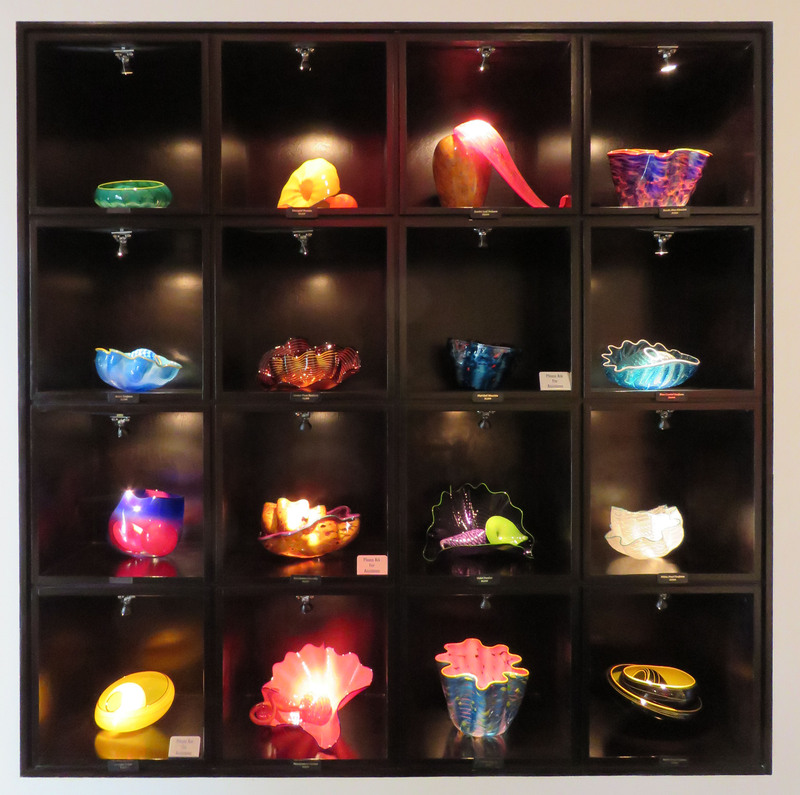 A display of small pieces from the Chihuly Gallery in Las Vegas. 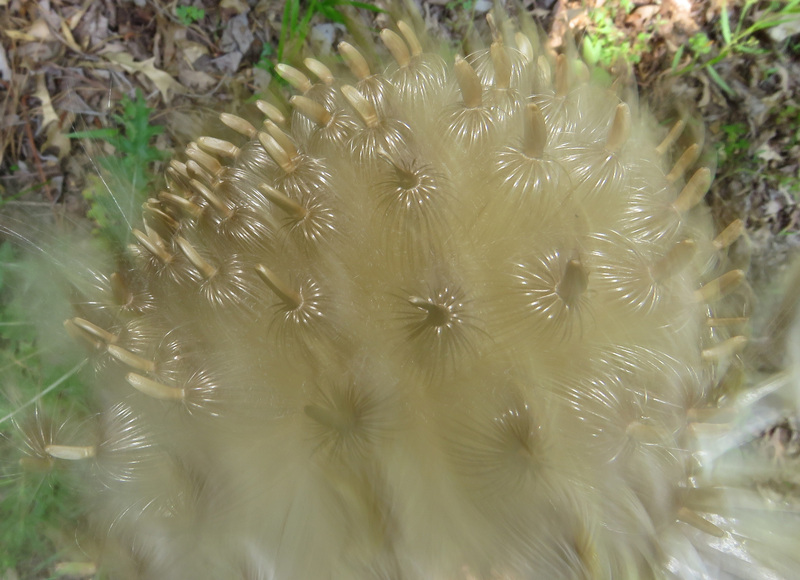 Some close-up pictures I have taken of thistles have brought his work to mind. 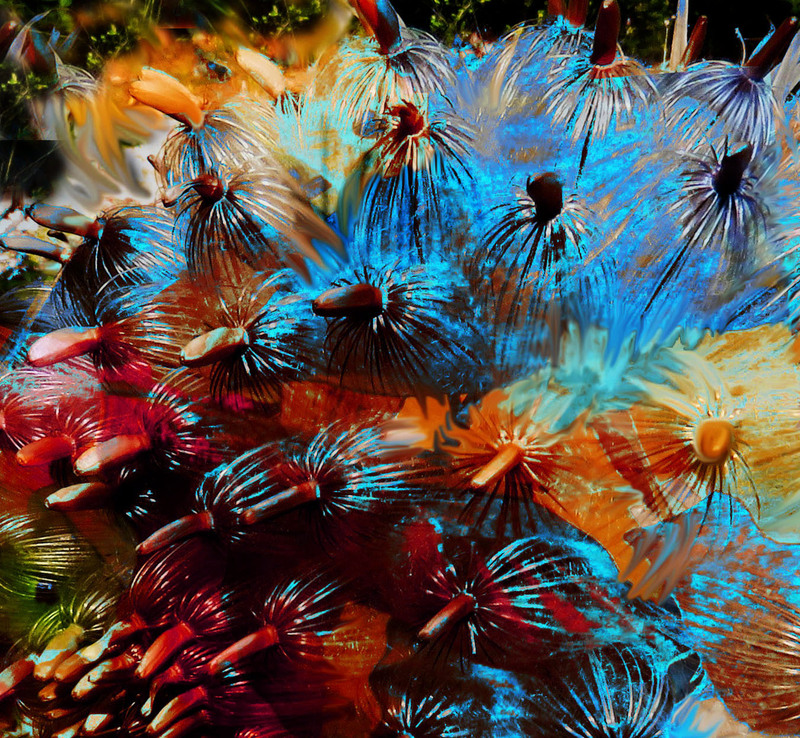 I had a bit of fun playing with layers and transparencies in Photoshop, trying to see how these seedheads could look if interpreted by Chihuly. 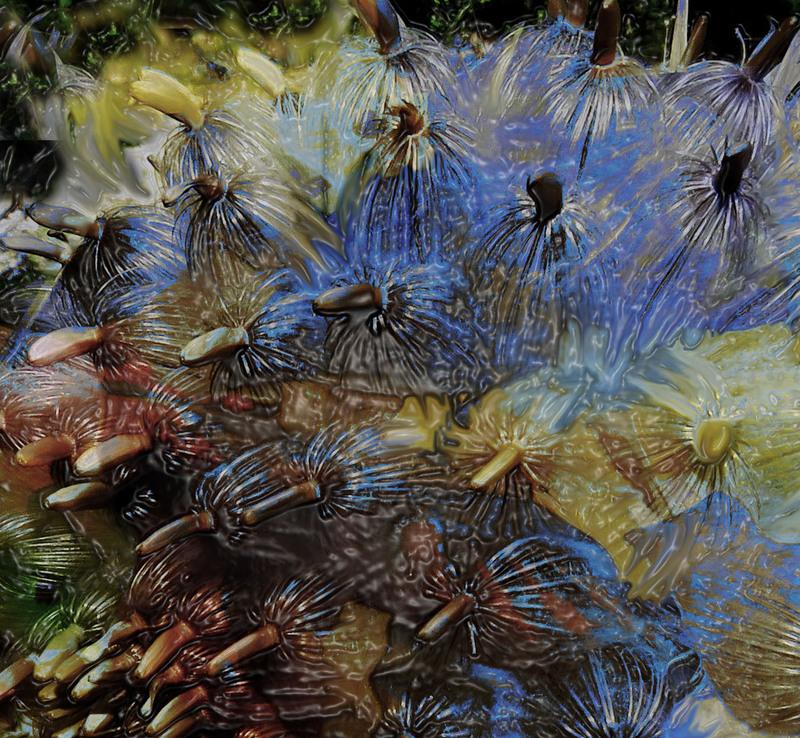 Here’s an easy one — I just put a transparent layer of the seedhead photo over one of my photos of the glass at Bellagio. The dark tones of the glass work came out a little too brown, and there is too much yellow for me, but it is a starting point. Here I shifted the colors, smudged the boundaries between colors, and added the “plastic” filter, which looks more glass-like than the actual “glass” filter. Here I shifted color hues, and played with brightness and contrast. I like this one and I can see myself doing more with it. 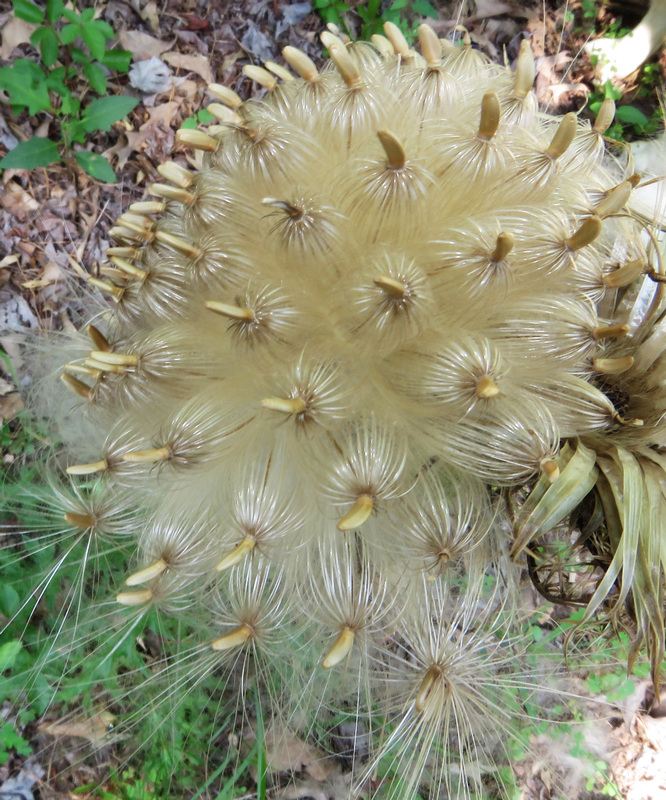 The original seedhead is the most beautiful in my opinion. I’m not trying to copy it, but to use nature as a starting point for art play, taking advantage of the variety and richness of details that I could never come up with on my own. 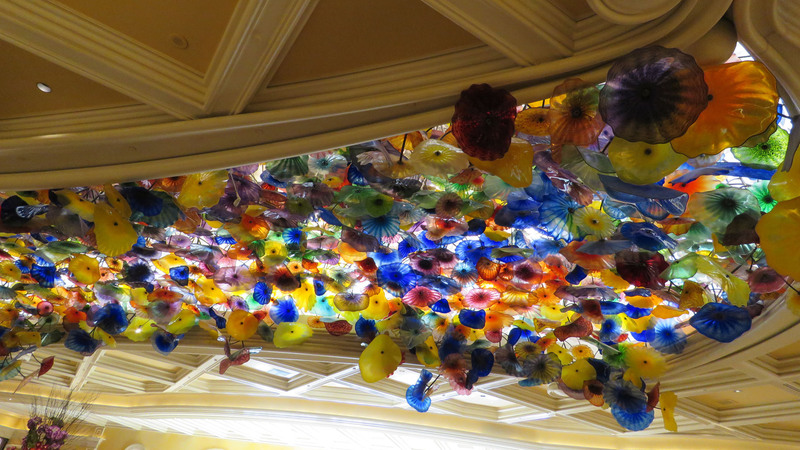 Chihuly highlights at the Bellagio – ceiling of the lobby, a free-standing sculpture in one of the lounges in the casino, small gallery in the back of the Conservatory. The large gallery is a little off the beaten path, but if she likes Chihuly and has the time, it is definitely worth a visit. It’s near the Aria and Mandarin Oriental (on the Las Vegas Strip, the hotels are the landmarks). From Bellagio you would continue south on the Strip past the Crystals Mall, cross Harmon Street but then turn right on the Harmon sidewalk and go down a block or two. There are other great galleries on that block too. I agree that the natural thistles are the loveliest! 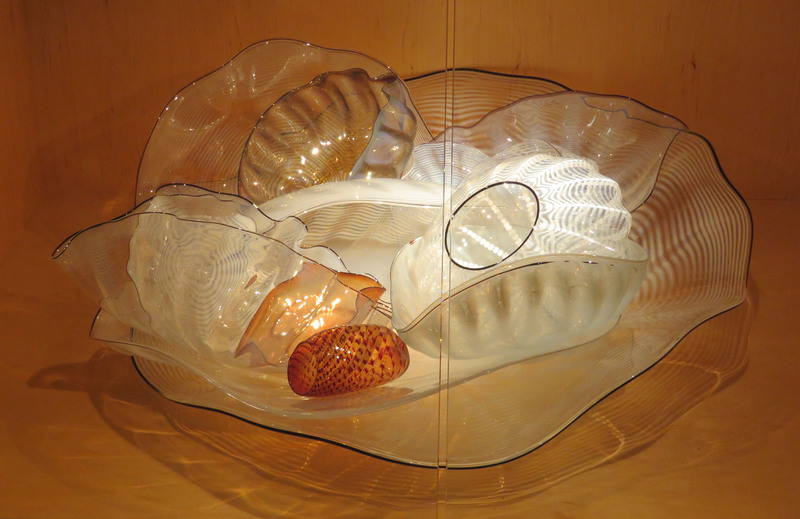 In fact, if there’s one thing about Chihuly’s work that I don’t love, it is the colors in some pieces–too much for me! Maybe he does lower key pieces but I don’t know them. The Boston Museum of Fine Art has a piece that looks VERY similar to the tall yellow-green one! The docent told us that she was giving a tour to school kids and one of them reached out and pulled one of the spikes out! Oops! I can never get too much color! You know they say there is a Southern/Northern taste for color, but in this case, he works in Seattle, so that can’t be what is at work in his color choices. And it’s funny that for years I thought his reputation was overstated, and I was basing that on just his piece that was on the set of the Frazier TV show. It was sort of maroony-brown with moss green rings on the inside, and I hated that piece! It bugged me in every episode! That’s so funny–my cousin has been after me to take a glass blowing class! I keep wondering what happens if you inhale . . .
That is a beautiful piece! It’s interesting what the man said about Chihuly’s work always being reconfigured when it’s re-presented. I wish you could do that with quilting! Wow again! The San Antonio Museum of Art has a small ceiling piece like that, maybe 1/8 the size of the one in Tacoma. I hope I can see that someday! Love the natural thistles and your photoshopped versions!